Ener-Core: Converting air pollution to clean energy, profitably. Originally founded in 2008 as Flex Energy, Ener-Core designs and manufacturers innovative systems for producing continuous energy from a broad range of sources, including previously unusable ultra-low quality gas. The Ener-Core Power Oxidizer, our patented oxidation technology, enables the conversion of the lowest known associated emissions into useful heat and power. With the Ener-Core Power Oxidizer matched to gas turbines, Ener-Core offers systems with fuel flexibility and pollution control for power generation. 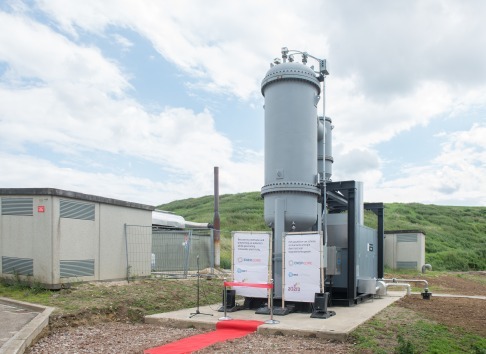 Ener-Core has developed the 250kW Ener-Core Powerstation EC250, and its larger counterpart, the 2MW Ener-Core Powerstation KG2-3GEF/PO, to transform methane gas, especially “ultra-low Btu gas” from landfills, coal mines, oil fields and other low quality methane sources into continuous clean electricity with near-zero emissions. Ener-Core, together with select partners, serve both private and government entities worldwide. Through its dedicated team of experienced engineering and scientific professionals Ener-Core drives product innovation that solves real-world challenges. Ener-Core is headquartered in Irvine, California, USA. The scale of this opportunity is vast and critical to addressing the biggest culprit in the battle against climate change – methane. We are eliminating a contributor to climate change and using it to generate clean energy. The EPA reports that 480 billion cubic meters of gases are released into the atmosphere each year, either through flaring or venting. These gases represent up to 65,000 MW of local clean energy that could power 65‐80 million homes. Because standard combustion technologies don’t work on these low quality gases, this potential energy source is burned away. Companies, industries and governments are literally burning money away. With the Ener-Core oxidizer technology, the limits are removed – opening up a new untapped clean energy resource with a large market opportunity. The world can now eliminate a contributor to climate change and use it to generate clean energy. These waste gases exist worldwide in industrialized nations, developing countries and emerging markets. Each of these regions generates harmful gases from landfills, coal mines, industrial facilities, chemical plants, refineries, and oil/gas fields. Given rapid growth and development of emerging economies, market growth is nearly unlimited. Ener-Core and its partners have estimated the total market size for its equipment at approximately $75 Billion. Ener-Core, Inc. became a publicly traded company in July of 2013. Four major milestones have occurred since the inception of Ener-Core, Inc. and the commercialization of the technology; the commissioning of Ener-Core’s first commercial 250 kW Powerstation at a landfill in the Netherlands, the successful operation of an ultra-low energy fuel for a large Canadian Oil company, the signing of a definitive agreement between Ener-Core and Dresser-Rand for the commercialization of the 1.75 MW Powerstation and the sale of (2) 1.75 MW machines into the Ethanol industry. JUNE 2014: First commercial unit commissioned and operating in the field.